If you took biology in highschool you probably remember turgor pressure. Turgor pressure is force exerted outward on a cell wall by the water contained in the cell. This force gives the plant rigidity, and may help to keep it erect. I think about turgor pressure a lot, because I am very lazy when it comes to properly wrapping vegetables and I often end up with dried-out, limp vegetables. The other week I bought a cabbage, and as usual I was lazy when putting it away and before I knew it, instead of being crisp and crunchy it was all soft and chewy. That is a good combination for a Mars bar, not so good for a vegetable. I decided to try to restore the freshness by restoring the turgor pressure. I wanted to submerge it completely in water but the only thing I had that would work to contain it all was a beer pitcher my ex-roommate stole. I dropped in the cabbage, filled it with water, then put it in the fridge. So here we are a couples days later and the cabbage is crispy and crunchy and it looks quite good. I haven't been able to eat any of it though because I neglected to realize that when the pressure built back up, the cabbage would swell. 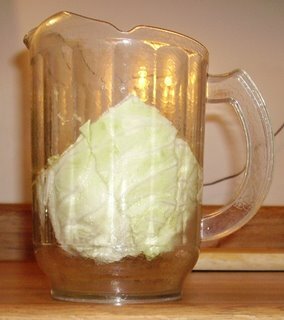 Right now that cabbage is so damn swollen it doesn't even come close to coming out of that pitcher. It is stuck in there so tight, when you poke a knife into it, the knife is squeezed so much it is hard to pull back out. I could hack bits and pieces out, but in order to eat it conveniently, I will have to let it dry out a bit. I poured out the water but that cabbage makes an almost perfect seal along the inside wall of the pitcher and the water poured out as not even a trickle. I guess the moral is that science may be cool, but as far as saving cabbages goes, it's not worth the time and effort - just go buy a new one.